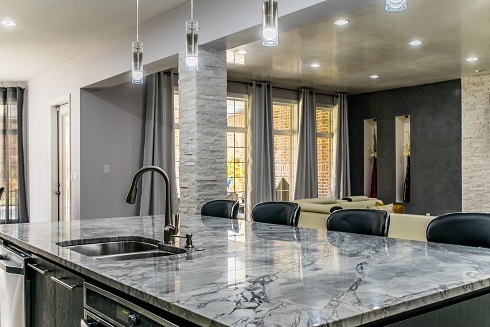 Quartz countertops in Chattanooga, Tennessee are a great choice for homeowners who love the look and feel of natural stone but want to skip the added maintenance and upkeep. This stunning stone brings the best of both worlds—incredibly durable, hypoallergenic, with virtually no maintenance needed! And, when you consider the added value and decades of superior performance, it's easy to see why quartz countertops are one of the most requested materials for countertop projects in Chattanooga. Engineered quartz features the versatility to complement any design style, decor, and taste. From shabby chic and industrial to bohemian and contemporary, you can be sure there's a quartz stone that’s perfect for your space. And because this is an engineered stone, countertop fabricators can create your countertop in any size or shape imaginable! Quartz countertops are an engineered stone, created and manufactured by highly-trained and experienced countertop fabricators. Your quartz countertops are created in a facility using a mixture that contains up to 94% crushed quartz along with pigments for color and a small amount of polymer resins to hold everything together. Quartz countertops offer superior performance with virtually no maintenance needed. And because these stones engineered, your countertop fabricators can create stunning customized colors and patterns to perfectly match your vision for your new space in Chattanooga. Fill out our free estimate form to get started. One of our Design Specialists will contact you within 24 hours. Non-Porous - The added resins ensure surfaces are non-porous for the lifetime of the stone. This means you won't have to worry about staining or absorption when it comes to your stone. No Maintenance - Your quartz countertops won’t ever need to be sealed. Armed with a soft cloth and a mild soap and water mixture, cleanup has never been easier! Endless Customization - Your countertop fabricator can create stunning custom colors, shapes, textures, patterns, and finishes for a truly unique look and feel. Superior Durability - The polymer resin additives result in a stone that’s harder than other countertop options like granite and concrete. Quartz is perfect for high-traffic and heavily used spaces because it’s nearly impossible to scratch. Stunning Beauty - Imperfections are virtually non-existent due to the controlled manufacturing process. Quartz countertops feature a deeply rich luster and can mimic the look of natural stone. 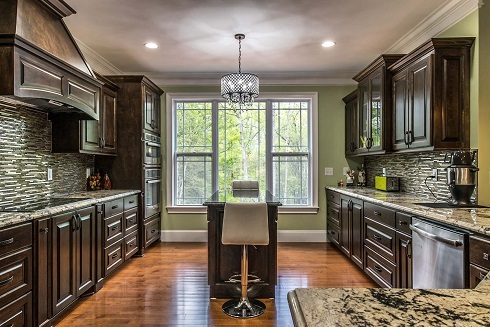 Unmatched Performance - Quartz countertops are naturally resistant to damages from impacts, corrosion, scratching, staining, chipping, and cracking. Engineered stone countertops in Chattanooga, TN offer a wide variety of benefits for your new space. Quartz countertops offer competitive pricing, durability, and remarkable beauty, just to name a few! For countertop solutions for your next project in Chattanooga, quartz should definitely be considered! Quartz gives you the freedom to explore more design options for your home than you might find with natural stone alternatives. Engineered stone can be fabricated in larger slab sizes and shapes, and installed with fewer visible seams. Quartz countertops can be fabricated in a rich spectrum of colors and patterns with a palette that is both bold and plentiful. From scarlet red to sapphire blue and midnight black, you can be sure your quartz countertop color will perfectly match your vision. Your quartz countertops will feature a consistency in coloration that few natural stones, like granites and marbles, can offer. Quartz will not have veins or varied hues, rather a much more consistent coloring throughout the entire slab. This makes matching multi-slab, multi-surface, and multi-room projects easier! Quartz is one of the absolute best choices for busy and bustling kitchens. Considering the superior durability, sustainability, performance, and hygienic characteristics, it’s easy to see how this stone has been quickly gaining popularity! And because this material is flexible enough to be fabricated in larger slab sizes, you can cover larger areas with fewer seams. It’s important to keep in mind that while this stone is incredibly durable, but quartz can be damaged by heat. Therefore, it is essential to use trivets or other protective pads to prevent scorching, discoloration, and damage to your quartz surfaces. Engineered quartz countertops offer virtually endless design options. This gives you the ability to create your dream space with ease. Whether you are dreaming of a dramatic and stunning space or the most peaceful of sanctuaries, quartz countertops will certainly deliver! It’s worth noting that engineered quartz countertops are significantly heavier than other materials like granite and marble. Not only should your cabinets be sturdy and strong, the building itself will need to be in good structural condition as well. This is especially true for older homes in Chattanooga and quartz countertop installations on upper floors. Contact Us - Simply contact us with the details of your project. Within 24 hours, you will be assigned a personal Design Specialist who will work with you for the duration of your project, and provide you with an estimate for your new dream space. Select Your Stone - Your Design Specialist will guide you through your slab and edging options, and help you choose the perfect stone for your project. Your personal specialist can even help you see how a specific stone will look in your space with the help of our Visualizer Tools. 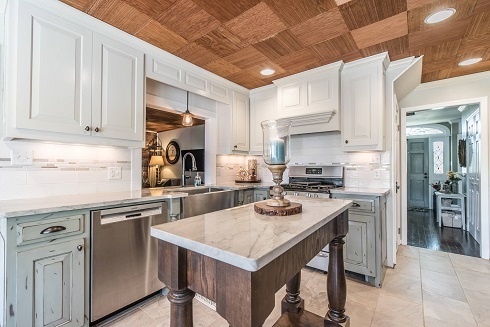 Schedule Your Templating - At your convenience, our experts will visit your space and meticulously measure everything, creating a template of your quartz countertops in Chattanooga. This will make sure that everything works just as it should on installation day. Fabrication - Our fabrication process is the quickest in the business. Following the template, your slab and edging will be fabricated and thoroughly inspected before sending it out for installation. Installation - Our expert Chattanooga, Tennessee quartz installation team will arrive on-time to professionally and efficiently install your new countertops with as little inconvenience as possible. You can expect your installation of fully functional countertops in 5-7 business days from the time of templating, guaranteed. Granite Empire can help you discover the possibilities of your new dream space with quartz countertops in Chattanooga, TN. Our friendly design specialists are eager to share the passion they have for these luxurious materials and help you turn your dreams into a reality. Contact us online, or by phone, to speak with one of our friendly Design Specialists today! They are happy to answer all of your granite, marble, and quartz countertops questions. They can also schedule your no-cost, no obligation consultation and help you get started on your dream kitchens and bathrooms with gorgeous new quartz countertops in Chattanooga, Tennessee today!